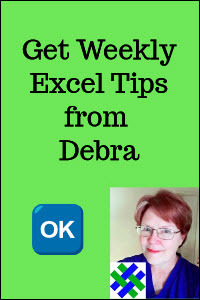 Use Excel Scenarios to store several versions of the data in a worksheet. For example, when preparing an annual budget, the Marketing and Finance departments may have different forecasts for sales. You can store each department's forecast as a Scenario, print the scenarios separately, or compare them side-by-side, with Summary Reports. Important Note: The Scenario Summary and Scenario PivotTable Report are not linked to the Scenario data, and they do not update if the Scenario data changes. Use these reports to compare the data, or print the current status, and then delete the sheets, to prevent confusion. Although Excel scenarios can be complex, a simple example is used here. The annual budget forecasts from both the Finance and Marketing departments have been entered, and stored as scenarios. Warning: This is a static report that does not change if the Scenario data changes. Delete this report after printing it, and create a new Summary when necessary. On the worksheet, click on cell B6. This is the Profit cell, and it changes, based on the sales and expense amounts. To compare the scenarios side by side, you can view the Scenario Summary sheet that was created. 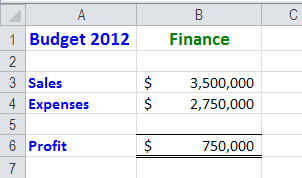 In this example, the scenario cells on the Budget sheet have been named, and those names appear on the Scenario Summary sheet, making it easier to understand. For example, cell B1 is named Dept, and you can see that name in cell C6 on the Scenario Summary sheet. There is no option for formatting the Scenario Summary when you create it. You can change the formatting in the completed report. On the worksheet, click on cell B6.This is the Profit cell, and it changes, based on the sales and expense amounts. 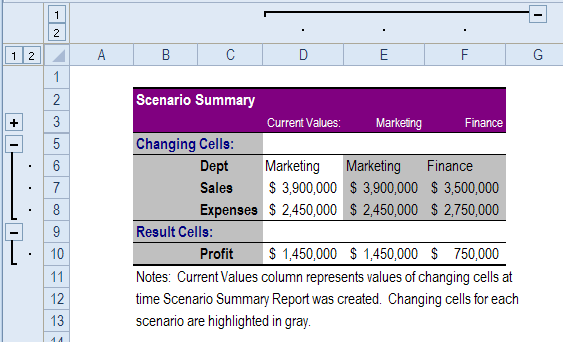 There is no option for formatting the Scenario PivotTable Report when you create it. 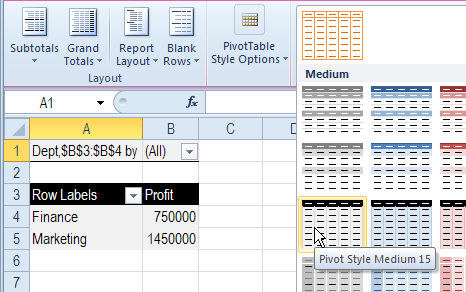 You can change the formatting in the completed pivot table, by selecting a different PivotTable Style.